In September, I took the trip of a lifetime to England. I toured Bath, Winchester, and London, and saw so many amazing things! One of the best parts of the trip was tea at the Jane Austen House in Bath where I was introduced to a delicious tea blend flavored with citrus and cinnamon. I've since looked for it online and have found that it's only available in England. However, a couple of days ago, I found an excellent equivalent from Bigelow. Walmart carries Bigelow's"Constant Comment", a wonderful blend of orange and spice flavors. I'm hooked! 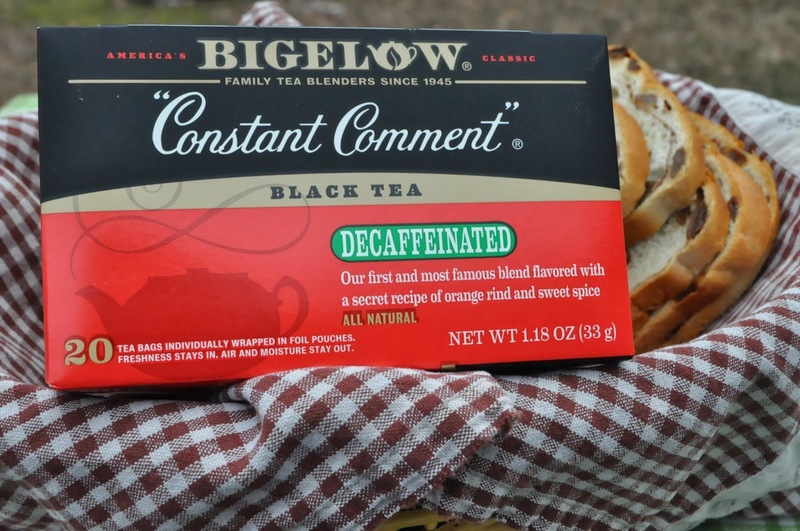 Besides being the perfect flavor I was looking for, this Bigelow blend is decaffeinated. I'm thrilled because I also want to use it for iced tea. My current iced tea blend is not decaffeinated, but I'm really trying to cut caffeine out of my diet so this will be perfect! I love to serve guests iced tea and it's so easy to make up a gallon in just a couple hours. I fill a gallon jug with hot water and add 5-6 tea bags. As the water is cooling in the fridge, the tea steeps. In a couple hours, I've got refreshing drinks for everyone! 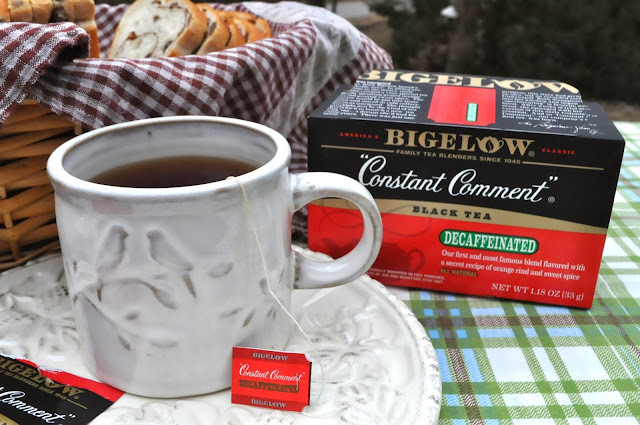 Hot tea is such a comforting and welcoming drink to serve my family and guests. It helps to have the right accompaniments to set the cozy atmosphere. My mom bought me a gorgeous red tea kettle for my birthday in October. Looks pretty great with my bright red tea box, doesn't it? This morning, I brewed a cup to have with my cinnamon swirl toast. It was lovely. 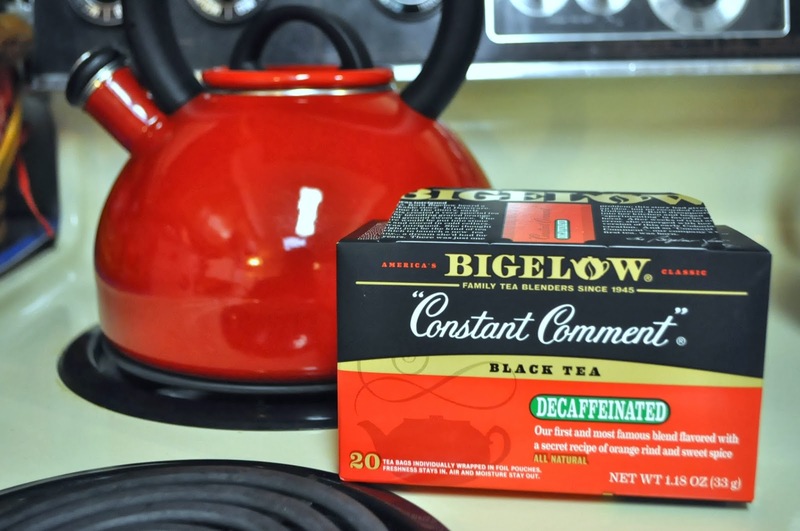 There are very few teas that I enjoy without sugar---this is definitely one of them. It had just enough sweetness, and the spice and citrus notes were subtle. I prefer a lightly flavored tea and this definitely met my expectations in flavor. How do you take your tea? Have you tried Bigelow? I'd love to hear about your experience and how you paired it with your favorite meal or treat. 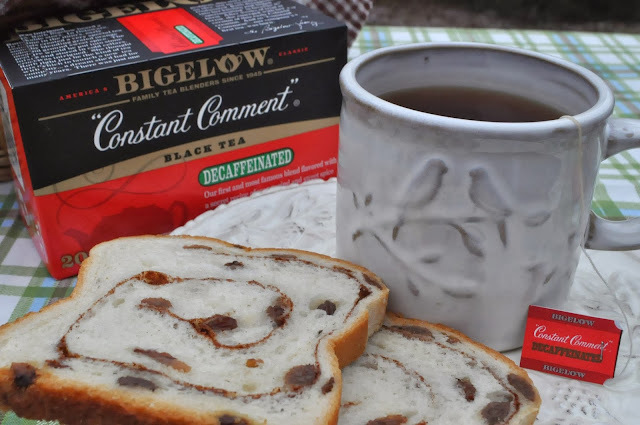 Make sure to visit our Pinterest board for more great ideas from Bigelow! This made me feel all cozy, so I went and made a cup of tea! Planning to buy this one to try also! Thanks, Sarah! I love ice tea all year long. I do not like hot tea. When I was growing up, I had to take hot tea with something else as a medicine and have not liked it hot anymore.Where you live now, not as many places to shop as in Oregon. I go near there when going to see my sister in MS.